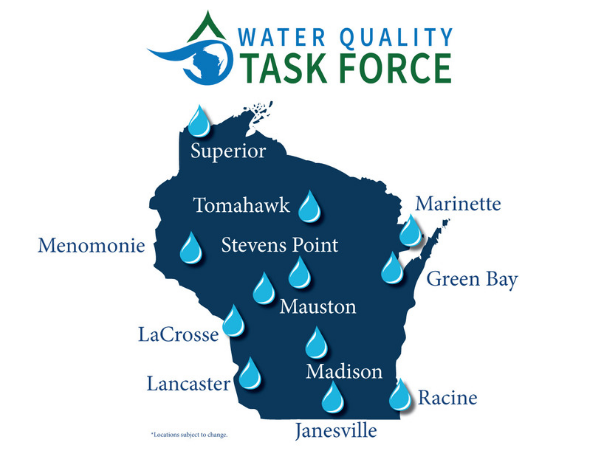 On March 20th, the first informational hearing for the Water Quality Task Force was held in Madison. Staff from four state agencies were invited to give presentations to explain the basics about surface and groundwater systems, current and emerging water quality problems and recommendations to solve these problems. See links to the presentations and Wisconsin Eye broadcast of the hearing below. We are pleased that leaders from both sides of the aisle are taking the time to learn about water quality issues impacting people around the state. As Rep. Novak stated, “I think the water has risen to the top of the priorities for both parties.” We are also pleased that the state agencies also presented recommendations, many of which are in Governor Evers’ budget proposal. The next informational hearing is planned for April 3rd in Madison. Several conservation and agricultural organizations will speak at this hearing. Please note: There is no public comment at this meeting. We do expect Wisconsin Eye to broadcast the meeting. Over the next several months the Water Quality Task Force will hold public hearings across the state. Please plan to attend one of the hearings. This is an opportunity to let the Task Force know which water quality issues are impacting you and your community. It’s time to emphasize that new solutions are urgently needed to protect and invest in our water wealth for all future generations. River Alliance will share more information once the locations are confirmed and the dates and times are announced. Janesville, Menomonie, Lancaster, LaCrosse, Racine, Green Bay, Mauston, Stevens Point, Tomahawk, Marinette and Superior. Wisconsin Eye Broadcast of the March 20th, 2019 hearing. Watch our blog, e-newsletter and social media for more information on the dates and times for these hearings. Sign up for action alerts to stay informed about legislative action that impacts Wisconsin’s rivers, lakes and watersheds.